Transdev is a group of companies, which owns not only in Germany, but in many other European countries as well a lot of small and medium sized rail operators. This picture is of a rare train: The grey train on the left is a Siemens Desiro Mainline of the Br 460 owned by Transdev and used at their Trans Regio service. 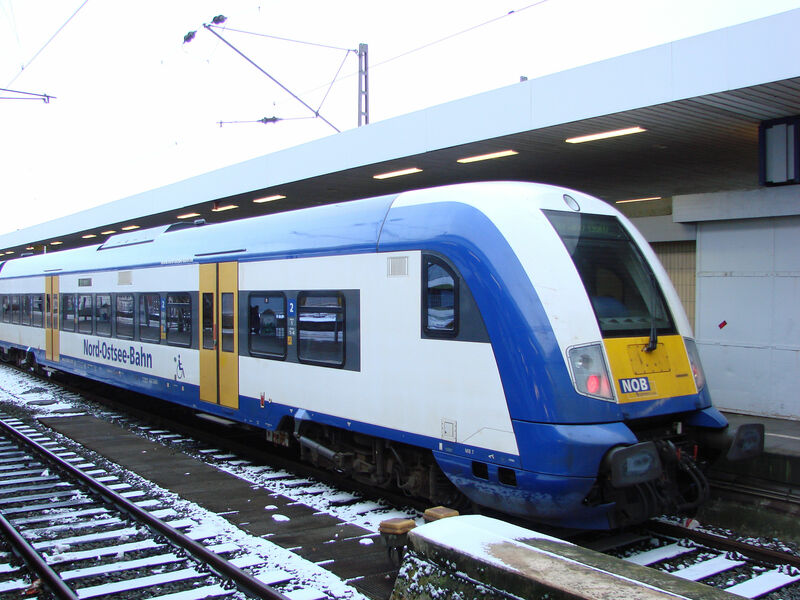 The Desiro MLs are rare trains, except in Austria and Belgium, where state railways have bought a number of them. 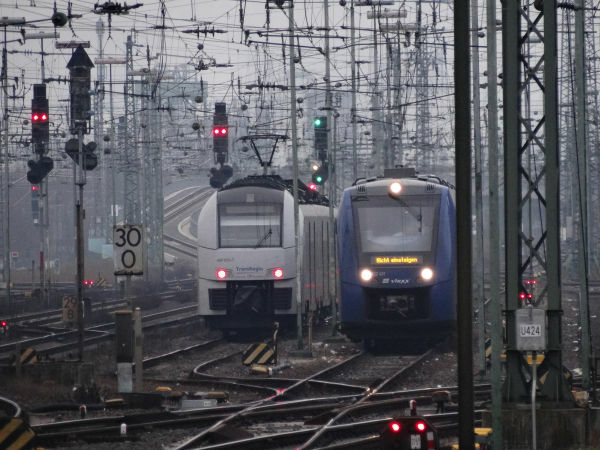 The train on the right belongs to vlexx, another private operator belonging to the Italian state railways, and it is a diesel multiple unit of the Alstom Lint family of trains. There are better pictures of that on this archive site, see vlexx. Picture at Mainz Hauptbahnhof 18.12.2016 by Ilkka Siissalo. 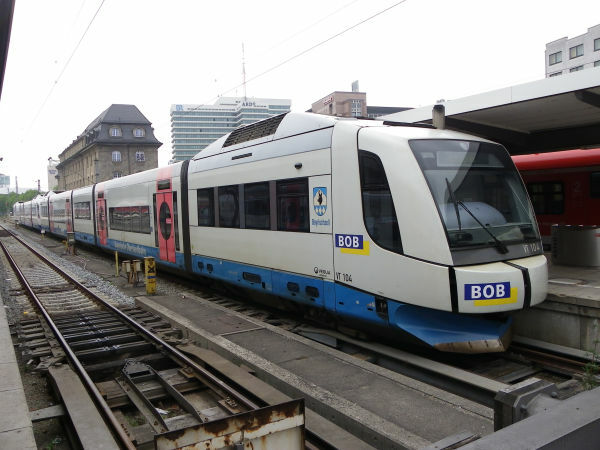 Bayerische Oberlandsbahn BOB is a medium sized operator, which belongs to the Transdev group of companies. This train is also quite special. 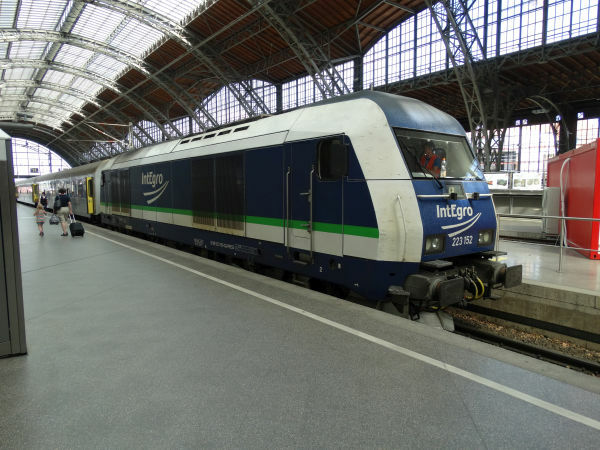 It is a diesel multiple unit of the type Integral S5 D95 built by Integral Verkehrstechnik AG. BOB bought them in 1998 and has 17 of them, each one with its own name. This one is named after the town of Bayrischzell. The Integral train was not a commercial success and only BOB has them in regular use. Picture at München Hauptbahnhof 30.4.2013 by Ilkka Siissalo. Two BOB Integral trains coupled head to head. Picture at München Hauptbahnhof 30.4.2013 by Ilkka Siissalo. As an extension to the existing Integral trains BOB / Transdev has also bought newer Bombardier Talent trains for the same routes that the Integrals have been serving. 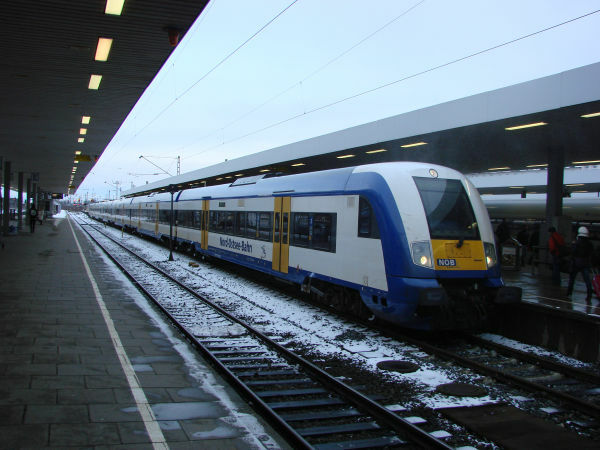 Here is a modern train consisting of three Talent units. 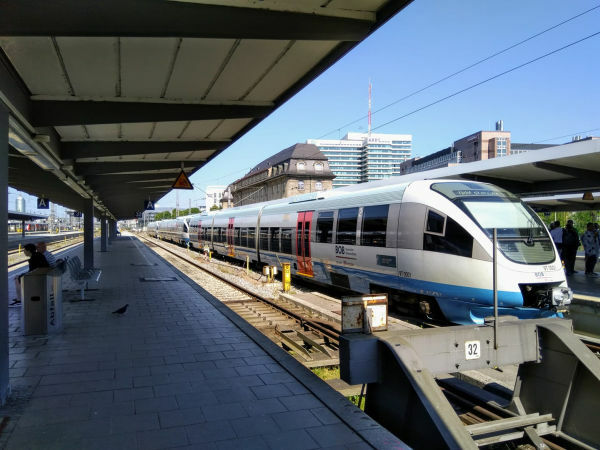 Picture from München Hauptbahnhof 16.6.2018 by Pauli Kyllönen. Bayerische Oberlandbahnen BOB won in a public tendering the regional passenger traffic between München, Rosenheim and Salzburg of Austria and for that purpose the Transdev group ordered a large number of new third generation Stadler FLIRT trains. BOB uses the marketing name Meridian for these trains. Here we have two six coach Meridian FLIRTs which have just arrived from München to Rosenheim. The two trains are separated here. One unit turns back to Munchen and the other one continues to Traunstein. BOB has three to six coach long FLIRT train units in use. Another view of the same two Meridian FLIRT units. A three coach long Meridian FLIRT parked. 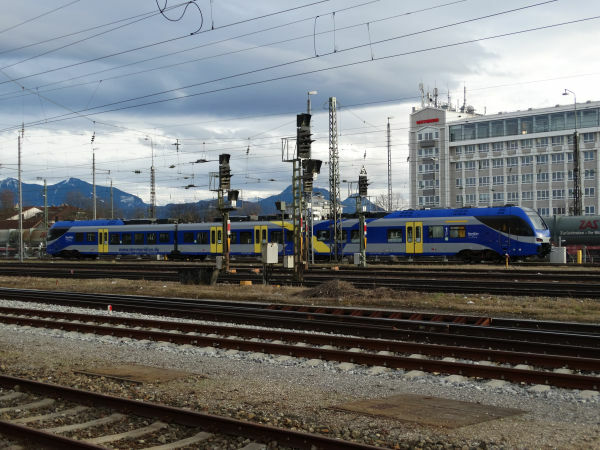 A 12 coaches long Meridian train consisting of two six coach Stadler FLIRT third generation electric multiple units, here on a Meridian service from Salzburg to München, stopping in Rosenheim on its way. 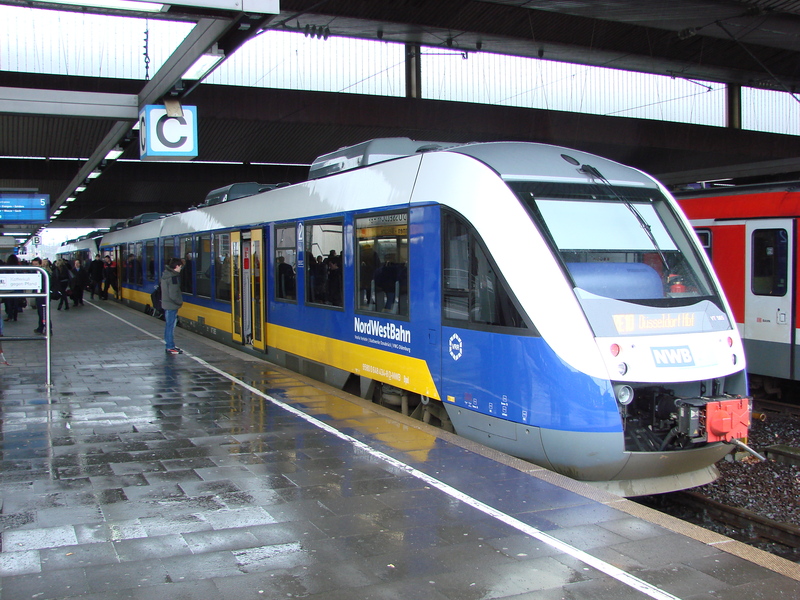 Mitteldeutsche Regiobahn MRB is a trade name used by two companies, Bayerische Oberlandbahn BOB and Transdev Regio Ost GmbH. Both companies belong to the Transdev group. The brand name MRB is used in Transdev's traffic in former East Germany, especially around Leipzig. 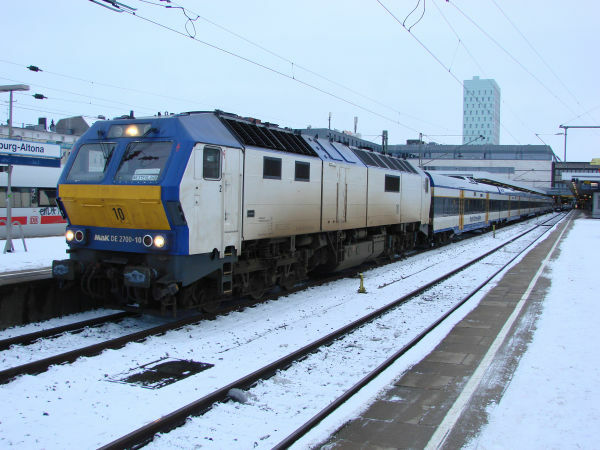 This locomotive is a Siemens ER20 Hercules, which has just brought in a regional express train from Cottbus to Leipzig. The coaches are old DR time express train coaches, just lightly renovated. The same ER20 Hercules as shown above. Same MRB train as shown above. The coaches are former communist East Germany's DR so called Halberstädter coaches. The following train on the same line Cottbus to Leipzig was a similar composition of an ER20 Hercules and old DR express train coaches, but since Transdev does not have enough of its own locomotives, this ER20 locomotive was leased from Pressnitztalbahn PRESS. It still had the stickers of its former renter, the train operator IntEgro. 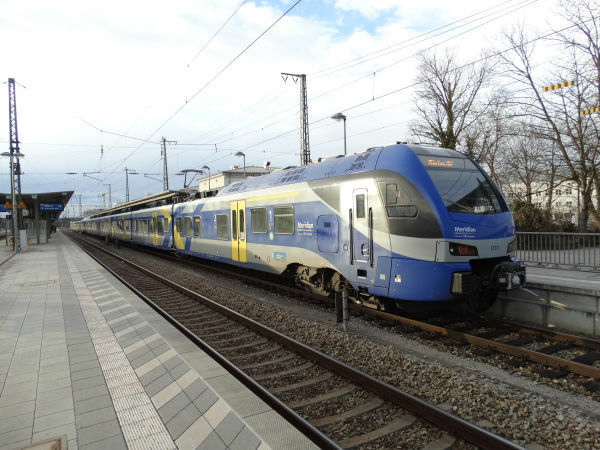 IntEgro Verkehr GmbH is a private train operator company which together with PRESS and Transdev Regio Ost had used the machine for hauling container trains in Bayern (Bavaria). 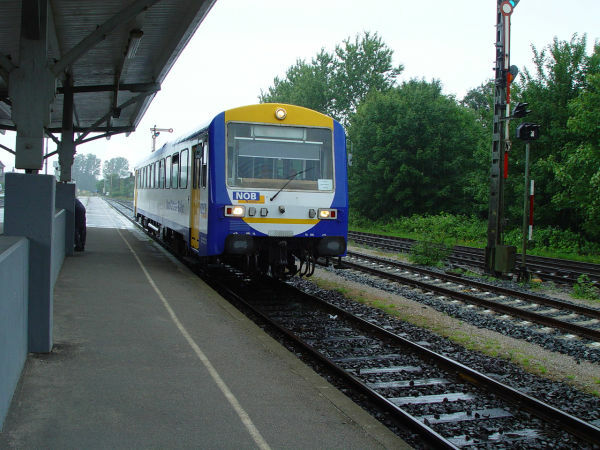 This picture is from those times when Transdev was not yet Transdev, but still Connex. 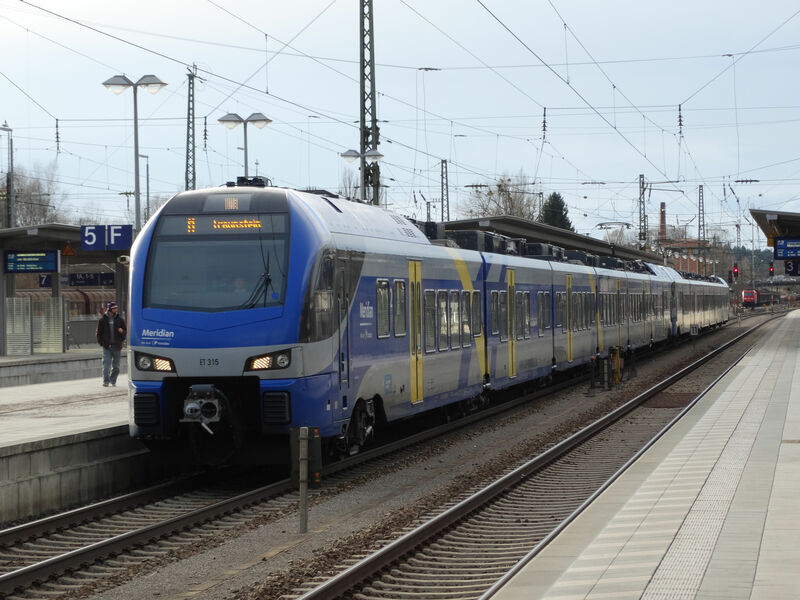 This is a railbus of the type NE 81 built by Deutsche Waggon Union. 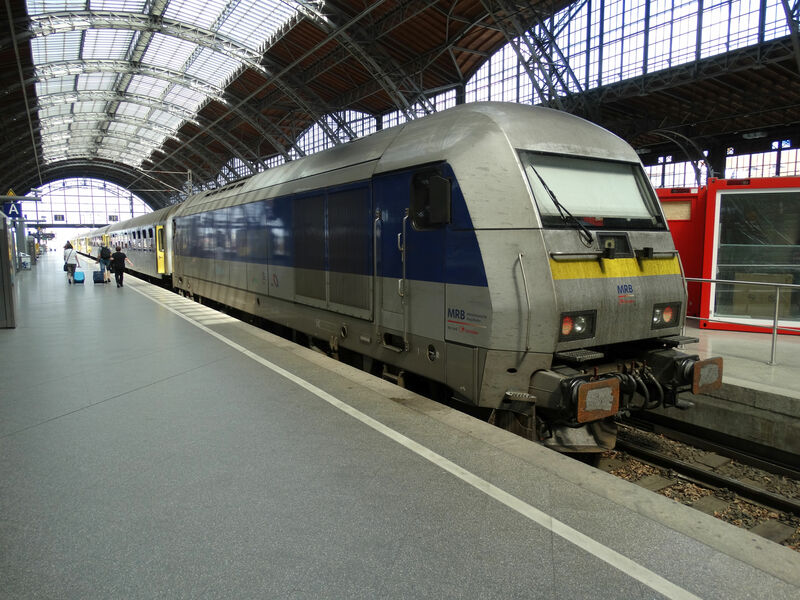 Only some private rail companies bought these trains in the beginning of the 1980s. "NE" refers to "nichtbundeseigene", not owned by the federal state, and the "81" refers to the year of the model. 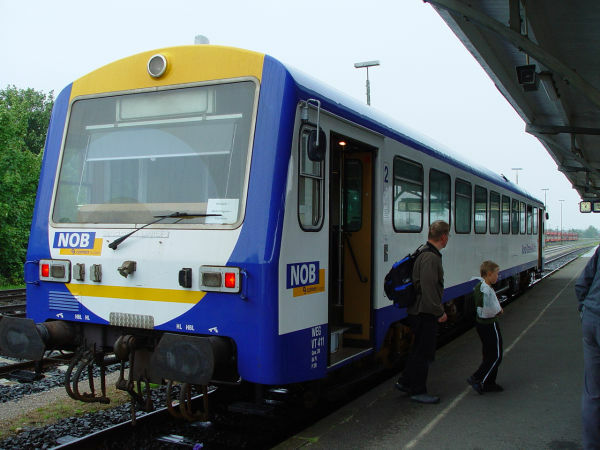 This one was owned by Württembergische Eisenbahn-Gesellschaft mbH (WEG), a Connex group company, and used here by another Connex group company Nord-Ostsee-Bahn NOB for traffic between Niebüll in Germany and Tønder in Denmark. 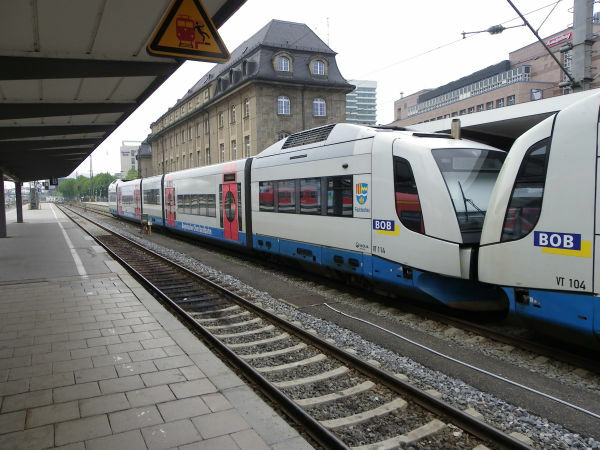 Today this same line is operated by Arriva Danmark, a daughter company of Deutsche Bahn. Picture in Niebüll 5.7.2004 by Ilkka Siissalo. Another picture of the same NE 81 railbus, here just arriving from Denmark to the station of Niebüll in northern Germany. Picture in Niebüll 5.7.2004 by Ilkka Siissalo. 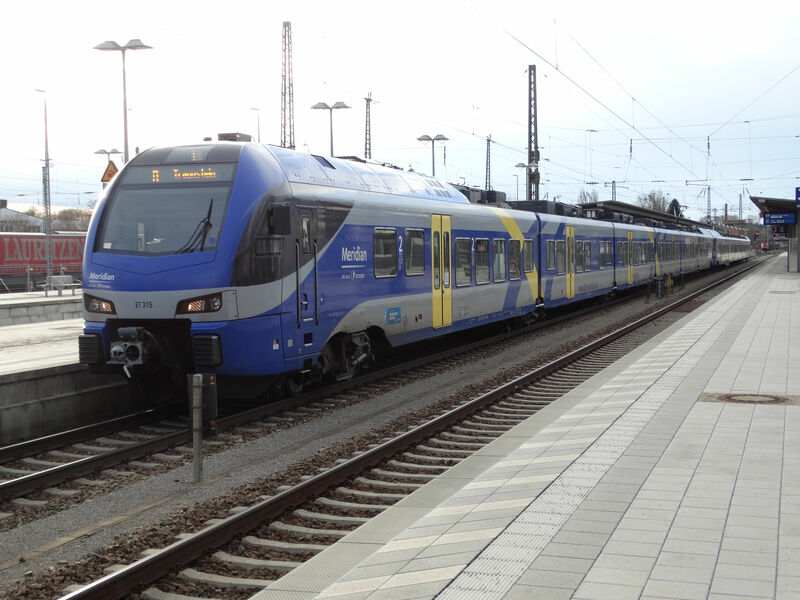 Two two-coach diesel railbuses of the class 648 of NordWestBahn NWB, another Transdev group company, have just arrived at the main station of Düsseldorf. 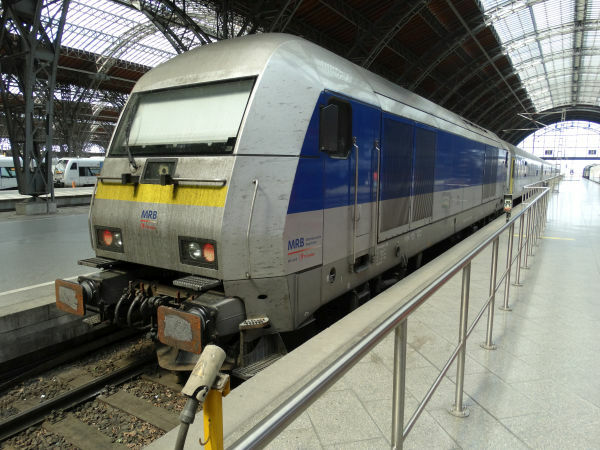 The class 648 is the type called LINT by its manufacturer, the French company Alstom. Picture at Düsseldorf Hauptbahnhof 26.2.2010 by Ilkka Siissalo. 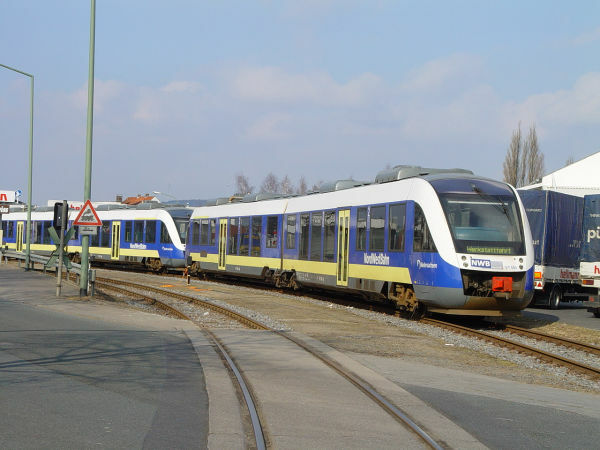 Two of NordWestBahn's class 648 LINT railbuses in Osnabrück, close to their maintenance depot. These trains are actually not owned by Connex/Transdev, but the state of Niedersachsen. Picture in Osnabrück 1.3.2003 by Ilkka Siissalo. Same trains as in the picture above. Picture in Osnabrück 1.3.2003 by Ilkka Siissalo. 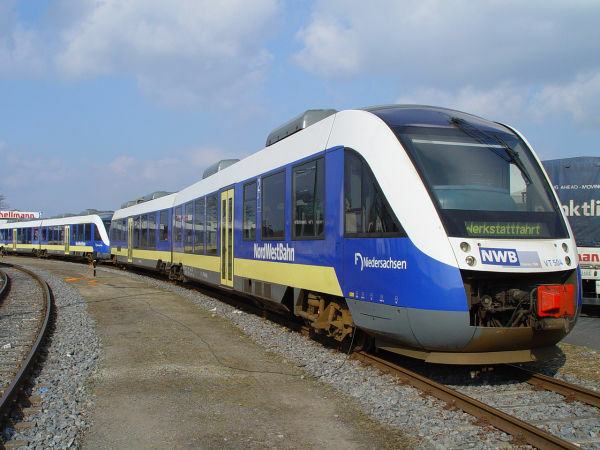 For many years the Transdev/Connex company Nord-Ostsee-Bahn NOB took care of the regional passenger traffic between Hamburg and Westerland on the island of Sylt. 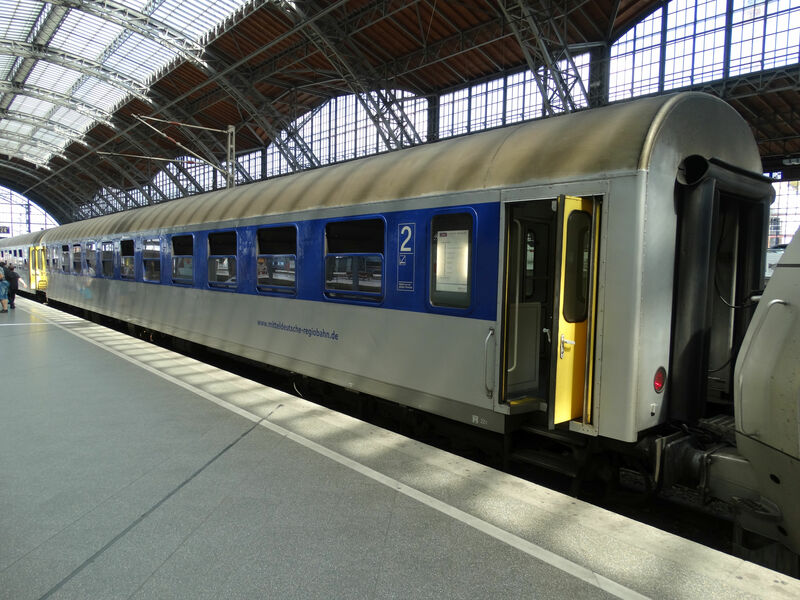 For this traffic specific coaches, so called married pair wagons, were designed and purchased, financed by the state of Schleswig-Holstein. Now 2016-17 the traffic went back over to DB, which will also take these married pair coaches as part of their stock. 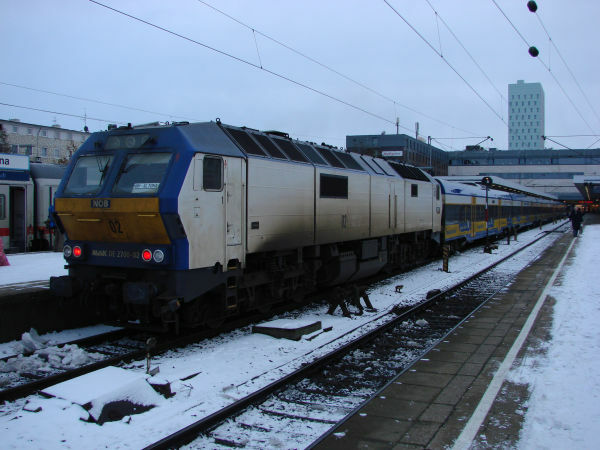 Here a NOB train is just arriving from Westerland to Hamburg Altona with married pair coaches and a driver's cab coach first. Picture at Hamburg Altona 31.12.2009 by Ilkka Siissalo. Closeup of the driver's cab of a married pair coach set. Picture at Hamburg Altona 31.12.2009 by Ilkka Siissalo. The other end of the same train as above. This mighty diesel locomotive, now listed as MaK DE-2700 was originally built by Siemens for Norwegian state railways NSB as their class Di6. But they were of such lousy quality and contained such an amount of design failures that NSB finally started litigation and returned them to the builder. Siemens then performed a number of repairs and tried leasing them via their leasing company Siemens Dispolok. Some of them worked for many years for NOB for their Hamburg to Westerland traffic. Others ended up for the private operator CargoLink in Norway - before the insolvency of CargoLink. Picture of a DE-2700 no. 10 at Hamburg Altona station 31.12.2009 by Ilkka Siissalo. Another DE-2700 diesel, this time the no.2. This married pair coach set has advertisement tapings to promote InterConnex trains. Picture at Hamburg Altona 31.12.2009 by Ilkka Siissalo.